A late night spent tasting some of chef Edward Lee's culinary creations led Trey to the idea that someone should blend a bourbon that would pair well with the bold flavors in chef Lee's cookbook and other modern cuisine. Without hesitation, Trey and Ed set forth. 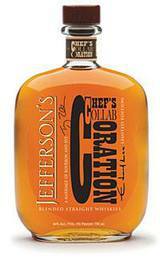 The result is a blend with a spicy upfront and a fruity finish, enhanced by the addition of rye whiskey into the mix. Perfect with meals, for mixing cocktails or simply drinking neat.